The Colorado River is also one of America’s most beloved natural resources, flowing through nine National Parks and supporting a $26 billion recreational economy. After 19 years of drought across the Colorado River Basin we know our state’s water supplies are vulnerable, and we’re facing a looming threat to our state’s communities and economic sustainability. Fortunately, strategies to address the potential risks and uncertainties of a continued dry future have been developed and are included in Colorado’s Water Plan. But these strategies are in need of funding and support. Gov. Polis has already shown leadership in his commitment to funding Colorado’s Water Plan, which lays out a blueprint for addressing the risks and uncertainties of a continued dry future. In his State of the State address, the governor committed to providing bipartisan, sustainable funding for the plan and pledged that his administration would do its part to implement the plan. He commended the work of his predecessor, Gov. Hickenlooper, but acknowledged that there is much more work to do. Polis also requested $30 million this year to help pay for the water plan, following through on a request from Hickenlooper for the same amount near the end of his term. Amid ongoing budget negotiations, the Colorado legislature proposed cutting the $30 million in proposed funding down to $10 million. This reduction primarily cuts funding to lay the groundwork for the implementation of a multi-state Colorado River drought contingency plan (DCP) approved this week by Congress. The conservation strategies envisioned in that process can increase our water security and introduce more flexible water management strategies to the benefit of all Coloradans. To implement this program, all Colorado River Basin states will need to reduce their use of water for the benefit of the whole system. In Colorado, this “demand management” would be a voluntary and market-based approach to conservation. It would be a flexible, dynamic way to provide greater water security, with benefits for the entire Colorado River Basin. The program would pay willing water users like farmers, ranchers, industries, cities and towns to temporarily reduce their water consumption, thereby keeping more water in our rivers and reservoirs. Those reductions can result from temporarily reducing the number of acres under irrigation or switching to crops that use less water, or similarly instituting conservation measures in cities and towns. This program is premised on stabilizing the levels in the Colorado River Basin’s largest reservoirs, providing greater certainty that we will have enough water in dry times. Conserved water would then be delivered to Colorado’s water “bank account” in Lake Powell, supporting the health of our rivers along the way. These increased streamflows support small businesses, agricultural providers, rural communities, the outdoor recreation industry, and river habitats as well as birds and other wildlife. On March 19, seven Colorado River Basin states finalized their DCPs, taking a major step toward a more secure water future. A key part of the DCP for Colorado is the opportunity to store saved water in Lake Powell. It’s now up to Colorado to create a demand management program and start putting water into it. Colorado has an opportunity to start building the framework we need to protect our water, but we can’t do it without the resources and support to construct proactive conservation measures like a demand management program. Although snow has been plentiful this winter, last year’s drought devastated farms and ranches, rural communities, and fish and wildlife across the state. We can’t afford to forget the images from just months ago: firefighters literally dropping gravel and mud on wildfires because there wasn’t enough water in the rivers; record-low water on the Yampa River that dried up the river; farmers standing in dry alfalfa fields; outfitters cancelling reservations because of low rivers, and fish so stressed from warm temperatures and low flows that anglers were urged to stay away. 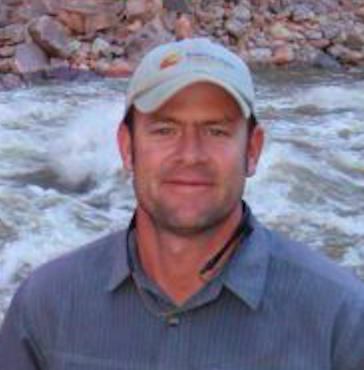 Matt Rice is director of the Colorado Basin Program for American Rivers in Denver.